Neal Ardley at Mansfield on Saturday. 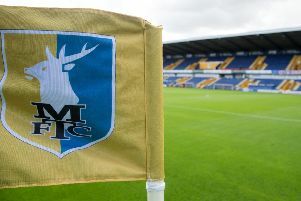 New Notts County boss Neil Ardley had no complaints after seeing his side beaten 2-0 in today's local derby at Mansfield Town. The struggling Magpies were beaten by two CJ Hamilton strikes as Ardley was given a baptism of fire in his first League Two game in charge. REPORT HERE. But he said he firmly believed he will steer Notts to safety. “I thought in the end they were the better team,” he said. “For the first 35 minutes it was a good game and our game plan worked well. Either team could have scored. “We had two one-on-ones, Nathan Thomas and Will Patching both got in, and you have to take those chances. It could have been very different – goals change games. “As we started to chase the game, it got a bit stretched and they've got a lot of pace and movement. He added: “In the two games I've been here we've been good in the first half and not so good in the second so that's something we need to address. “We were disappointed with their first goal, coming in round the back post with the bodies we had in there. “That's a common theme and that's something else we have to sort out and maybe one or two fresh faces coming in.